Rabbi Storch is currently a member of Ner Israel’s Kollel Avodas Levi and the Rav of Congregation Ohr Simcha in Baltimore MD. He is the mechaber of two sefarim on Shas titled Tiferes Aryeh and Tiferes Aryeh on Zevachim, and most recently authored the book “The Secrets of the Stars”. 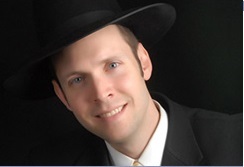 Rabbi Storch also serves as the Rabbi for the extremely popular “Ask the Rabbi” on BaltimoreJewishLife.com.